Author Howard Blum about his book: I wanted to write a story about the intrepid men who traveled from the newly civilized West to a place that remained excitingly dangerous, a fierce and lawless land. I wanted to tell a story about people so squeezed by the economic hardships of the times that they were willing to do or to try just about anything to fill their lives with the prospect of something better. I wanted to write about heroes, villains, and dreamers who joined the great stampede to the frozen north. I wanted to capture the boldness, self-reliance, and tenacity of men and women who helped shape a still vibrant strand in the American character. I wanted to tell an engaging tale that contained both high drama and a perplexing mystery. And, oh yeah, as I said, if all that wasn’t challenge enough, I wanted to write a true story, to boot. For me to be drawn to a non-fiction book it has to be something unique! I prefer to drift off into a made-up world that someone else creates. OK, it's escapism. But every now and then a true story comes along that triggers the escape mechanism in my mind and I HAVE TO read the book. The Floor of Heaven is one of those rare books. Howard Blum sets the stage for this true life tale so perfectly, the reader forgets it's true! Blum tells the story of three men hunting for a better life, and the place they chose was 1896 Alaska, the Yukon. Gold Rush territory. Soapy Smith, Charlie Siringo and George Carmack, a swindling con man, a Pinkerton detective and the prospector who's find at Bonanza Creek started the Yukon gold rush, respectively. Three more diverse people you'd never find, but they all shared the drive to make something better of their lives. Thanks to Blum's ability to tell a story I was entranced from the very beginning. In writing The Floor of Heaven Blum unearthed first hand accounts of these men's lives, so through the use of letters, diary entries, poems, legal papers and any number of written accounts, Blum weaves together the good, the bad and the often ugly that permeated their struggles. This book is structured so flawlessly that you must constantly remind yourself that this is real! These things really happened! 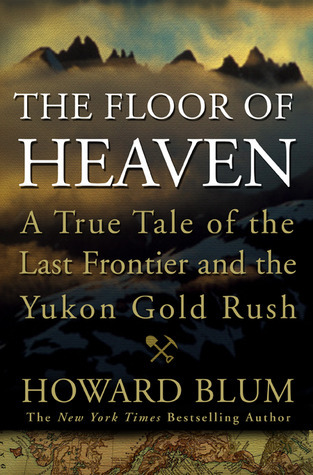 I highly recommend The Floor of Heaven, be prepared to step back in time and watch as the last days of the Alaskan frontier and the mad rush for gold unfold on the pages in front of your eyes. According to Deadline.com Fox 2000 has acquired screen rights to The Floor Of Heaven. I can't wait to see this one on the big screen!